A short presentation on the techniques & tools used for malware analysis followed by a live example. I will be showing behavioral analysis approach which includes setting up a inexpensive, flexible environment & tools required for understanding inner-workings of malware. Case study of an ironic web implementation. What: The Software Process Improvement Network (SPIN) hosts a monthly event. This one is on eGovernance with Anupam Saraph, CIO of Pune City, and Gautam Pal, Director of ETDC. 1. Dr. Anupam Saraph, CIO of Pune City, will speak on the IT quality issues in the e-Governance domain. We have a ZFS building as a module and the following primitive operations are possible. See the full article, for more details and some interesting issues related to the license compatibility between ZFS and Linux. Pune-based KQInfoTech is an organization started by Anurag Agarwal and Anand Mitra, both of whom chucked high-paying jobs in the industry because they felt that there was a desperate need to work on the quality of students that is being churned out by our colleges. For the 2 years or so, they have been trying various experiements in education, at the engineering college level. All their experiments are based on one basic premise: students’ ability to pay should not be a deterrent – in other words, the offerings should be free for the students; KQInfoTech focuses on finding alternative ways to pay for the costs of running the course. See all PuneTech articles related to KQInfoTech for more details. In the semiconductor and electronic design industry, SystemVerilog is a combined Hardware Description Language and Hardware Verification Language based on extensions to Verilog. As companies start migrating from Verilog to SystemVerilog it is becoming importatnt that they learn the tools of tread to effectively use it. Cliff Cummings is President of Sunburst Design, Inc., a company that specializes in world class Verilog, SystemVerilog and synthesis training. Mr. Cummings is an independent consultant and trainer with 27 years of ASIC, FPGA and system design experience and 17 years of Verilog, SystemVerilog, synthesis and methodology training experience. Mr. Cummings has completed many ASIC designs, FPGA designs and system simulation projects, and is capable of answering the very technical questions asked by experienced design engineers. In emergency situations like pandemic outbreaks, power failures, riots, strikes, infrastructure issues, it is important that your business does not stop functioning. A plan to ensure this is called a Business Continuity Plan (BCP), and it is of prime importance to your business to ensure minimum disruption and smooth functioning of your operations. Earlier most companies would document business continuity plans only if their clients asked for it and would focus mainly on IT recovery. But scenarios have changed now. Corporations of all sized have now realized the importance of keeping their business functioning at all time and hence they are working towards a well defined business continuity management framework. 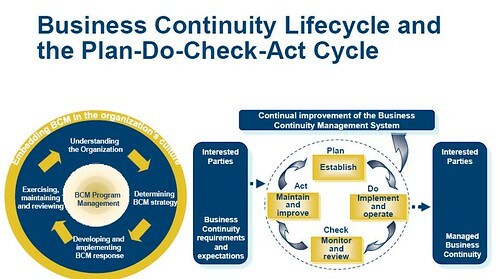 Business continuity (BC) is often understood as a process to handle events that could disrupt business. However, BC is more than just recovery. The plan should also ensure proper business resumption after recovering from the disruption. How does one start with BCM? The first step is to conduct a Business Impact analysis. This would help you to identity critical business systems and processes and how their outage (downtime) could affect your business. You cannot have plan in place for all the processes without considering financial investments needed to have those in place. CEO’s inputs and client BC requirements also serve as input for impact analysis. The next step is to identify the situations that could lead to disruption of the identified critical processes. It might not be feasible to have plans for each and every situation, as implementing the defined plans needs to be practically possible. After the situations have been identified one needs to identify different threats, threat severity (how serious will be the impact on business if threat materializes) and their probability of occurrence (likelihood of threat materialization). Based on threat severity and occurrence levels critical risks are identified. The identified risks and additional client specific BCP requirements serve as inputs to the creation of BCPs. BCPs should focus on mitigation plan for the identified risks. BCP should be comprehensive, detailing roles and responsibilities of all the response teams. Proper budget needs to be allocated. Once the plan is documented the plan should be implemented. The different implementation as per BCP could include having redundant infrastructure, signing up Service Level Agreements (SLAs) with service providers, having backup power supply, sending backup tapes to offshore sites, and training people in cross skills, having proper medicines or masks for addressing pandemic situations. BCP should also have proper plans in place to resume business as usual. Business resumption is a critical and very important aspect of business continuity framework. Once the plans are documented and implemented the plans should be regularly tested. The tests could be scheduled or as and when the need arises. One can simulate different tests like moving people to other locations, having primary infrastructure down, testing UPS and diesel generator capacity, calling tree tests, evacuation drills, having senior management backups to take decisions, transport arrangements etc. The tests will help you identify areas which need improvement in the BCP. The gaps between the expected and actual results need to be compared. The test results needs to be published to senior management. The plan needs to be reviewed regularly to update latest threats and have mitigations for the critical ones which will result in continuous lifecycle. One can schedule internal audits or apply for BS25999 certification to ensure proper compliance to BCP requirements. Pune faces threats of irregular power supply, pandemic out break etc which could lead to business disruptions. One needs to have detailed plans for critical threats to ensure continuity of critical operations. The plans should also have detailed procedure to ensure proper business resumption. Plans may be documented but actual action during emergency situations is very important. BCP requirements can only be effectively implemented when proper budget allocations are planned. So for specific BCP requirements cost negotiations with the client are important. Usually this is ignored, so it is important that the sales team should be appraised before agreeing on BCP requirements with the client. Dipali Inamdar, Head – IT security in Geometric Ltd, has more than 11 years of experience in Information Technology and Information Security domain. She is a certified CISA, ISO27001 Lead Auditor, BS25999 Lead Auditor and ISO2000 Internal auditor. She has worked in sectors spanning BPO, IT and ITES companies, Finance sector for Information Security and Business Continuity Management. She is currently operating out of Pune and is very passionate about her field. See her linked-in profile for more details. Pune’s resource for startups, the Venture Center has yet another service that could be valuable for Pune’s startups. The Venture Center Library has been created specifically to support and enhance the entrepreneurial ecosystem in and around Pune. They are targeting entrepreneurs, scientific researchers, technology innovators, IP & technology commercialization professionals and venture investors to take advantage of their collection of books, periodicals, reports and research services. If you just want to browse/read books at the library itself, it is free until the end of 2009, and after that it will cost Rs. 400 per year. If you want to check out books, there’s a Rs. 2000 refundable deposit and a Rs. 400 yearly fee – which allows you to check out 2 books for up to 14 days each. Look here for details of membership and fees. Venture center is an incubator mainly targeted towards startups in biotech, chemical and material sciences. It has been set up using government funds, and is housed in NCL‘s premises, but is planned as an independent entity that needs to become self-sustaining in a few years (based on taking equity/fees from the startups it helps). Check out the venturecenter tag on PuneTech for all PuneTech articles about Venture Center. Moblin is short for ‘mobile Linux‘, is an open source operating system and application stack for Mobile Internet Devices (MIDs), netbooks, and nettops. Built around the Intel Atom processor, current builds are designed to minimize boot times and power consumption to create a netbook and MID-centric operating system. The netbook/desktop version of Moblin currently supports other chipsets based on the SSSE3 instruction set, such as the Core2 and some Celeron processors. On Thursday, 22 October, 10am to 4pm, in Le Meridien, Pune, Intel will hold a free, seminar to help developers understand this platform, the surrounding ecosystem, and also to meet key players in this ecosystem. Basically, any Linux/mobile developer interested in building rich internet and media experiences on mobile devices (phones, handhelds, netbooks, nettops, in-vehicle infotainment and embedded systems) should attend to understand the Moblin ecosystem, and also to meet key players like Novell, Phoenix, Wind River and explore new business opportunities. The netbook has become a one of the most popular consumer devices in the market today, but its true potential has been limited by applications that are not optimized for its mobility and small screen size. The Intel Atom Developer program helps developers to create innovative new applications for mobile devices using the Atom processor. The program gives developers access to multiple classes of customers, and allows them to target Moblin and Windows based devices using a single toolset. This event will also give an overview of this program, the validation procedure, the APIs and the app marketplace framework. Registration and Fees: This is free for all to attend. Register here. Update: the competition is over – Sandeep Gautam has won the Google Wave invitation for this suggestion. The offline tech scene in Pune is thriving, as one look at the PuneTech events listing and the PuneTech calendar will show. Pune Tech posts often draw fairly detailed comments. See for example the comments for this post and this post. Pune’s techies are of course very active on twitter. Look here, for a list of 700 Pune twitterers, and see this post and this post for some prominent twitterers to follow. The PuneTech linked-in group has over 1300 members. In general, see the groups and organizations page on the PuneTech wiki, to see a whole bunch of other groups and mailing lists in Pune. Most of these are basically mailing lists, and forums. I wonder whether there are other ways in which techies in Pune can find other like-minded people, and collaborate in more ways. Would chat be interesting, like proto.in uses? Or IRC? Should we be focusing on Orkut or Facebook or both? Is there something intersting that can be done with YouTube? Can we use some new technology in new ways to bring people closer together? Maybe Google Wave? Give your suggestions in the comments section below. The best suggestion gets a Google Wave invitation. You can get the invitation for yourself, or you can use it to invite someone else. If you’re not interested in the invitation, please say so in your comment. Anuraag has a 1st class Bachelors of Commerce degree from Mumbai University. He currently works with Laymen Consultants – a Mumbai based Training Company as Financial Trainer & Speaker on Finance. He also works as Chief Investment Officer with Profound Consulting Pvt. Ltd., Mumbai – a Proprietary Trading and Investment company investing in various Asset Classes. He is a visiting faculty at Garware Institute of Career Education and Development, Mumbai University and a Speaker at Rotract club seminars for Wealth Building and Stock Picking. He is founder and chief convener of Mumbai Investors Group – a closed investor forum. Chanakya is the world’s oldest management Guru. He lived in 3rd Century BC and his book Kautilya’s Arthashastra has guided generations on good governance. It is also a book of management and has various ideas and principles that can be applied in the field of modern project management. From planning of projects, to understanding a project in detail, execution of projects and successful completion of projects he has left nothing untouched. These ideas are simple to understand and practical in its application. The session will bring out the age of ideas of Chanakya in detail. Questions and considerations to set correct expectations around test automation.